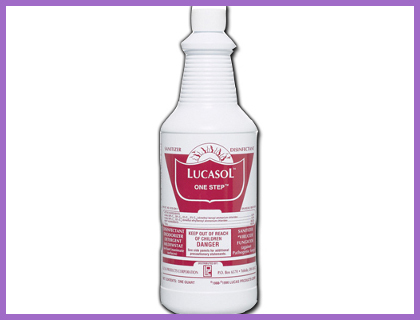 Lucasol One-Step Disinfectant is a ph Neutral cleaning solution that has been designed to clean your tanning bed acrylics and surrounding area. Lucasol cleaning solution is a very versatile product that can be used for many applications in your club. We have found that many clubs use Lucasol for safely cleaning their workout equipment as well as general areas in the club. Lucasol is sold to you in concentrated form. One capful per gallon of warm water is all you need for normal applications, add 2-3 capfuls for extreme applications. With Lucasol™ One Step™, the fear and guesswork is taken out of assuring that your tanning salon is sanitized and disinfected…and your clients are safe. This product when used as directed, is formulated to disinfect inanimate, hard non-porous surfaces: floors, walls, metal surfaces, stainless steel surfaces, glazed porcelain, glazed ceramic tile, plastic surfaces, shower stalls, sink tops, toilet bowls, metal, sealed granite, sealed marble, plastic, chrome and vinyl, windows and mirrors. It’s also safe on washable, hard, non-porous surfaces: enameled surfaces, painted woodwork, Formica®, and exercise equipment…and is safe for the acrylic surfaces of your tanning beds.